Designer, Kelli Ellis, recently attended the High Point Market -- the largest industry-only home furnishings trade show in the world. We asked Kelli to report back to us what she saw, and luckily, she graciously agreed to do so. 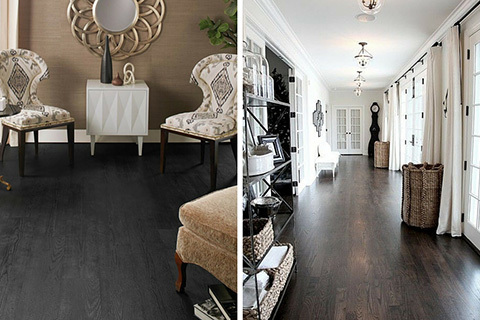 From our 2016 Design Trends Issue of Beautiful Design Made Simple, Kelli speaks about the wide reaching trends that were highlighted during the market. "... it appeared trends were all over the place for 2016. For me, that is a great thing because as designers and consumers we want what we like in our homes, not just trends. When we can hit on both though, it's a plus. Here's what I saw..."
Blue was a hit this market. I'm obsessed with dark teal blue, navy and any variation there of. From high gloss cabinetry to walls, I was in heaven with all the blue. Using it in several of my current projects, I was drawn to it, of course. Of course, gold is still going strong. 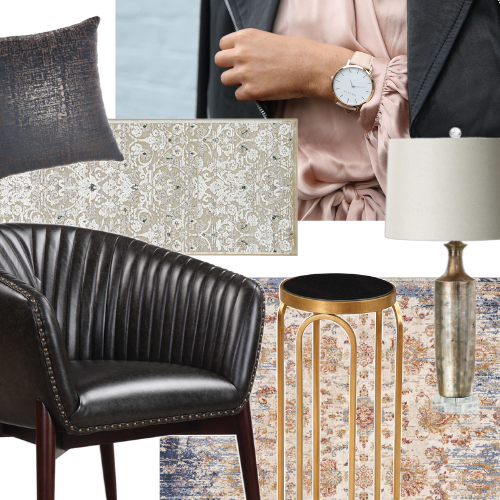 My rule of thumb is to not use one metallic exclusively, but mix within the room, so you have flexibility in your look. Showcased here in the Emporium home and Noir showroom. Copper and rose gold are popular too, but since they are more difficult to match, they will be less of a trend. Even some manufacturers that are notoriously colorful and bright, moved to some modern metallics. As always acrylic is popular and always a show stopper (under the best lighting it is breathtaking!) The pairing of eye-popping velvet with acrylic traditional, was a stunner. Rustic woods, fur and subtle shine blend beautifully in the Bernhardt Showroom. Seen in many of the showrooms like Noir, Berhardt, Emporium Home and Koket, black, navy and plum walls, set off the furnishings and lighting beautifully. Not Granny's florals, but larger, over-scale beautiful florals with birds, keeps the perfect season in sight all-year-round. "Remember, trends come and go, so design with your heart in mind. Choose what you love first then find a unifying color to build upon. Designing your ultimate home can be less daunting when you do some homework and identify what styles make you smile. Happy Designing in 2016!" Kelli Ellis, interior designer and lifelong traveler, represents the epitome of livable luxury and casual international style. Her celebrity and discerning clientele benefit from her extensive world travels, which bring pieces of exquisite furniture, dramatic artwork and unique accessories used to create thoughtful havens. Learn more about Kelli and her interior design work by visiting her website at kelliellis.com.